LED lights are a great way to upgrade your pool for this summer! Having a pool in your backyard is a great addition for those hot summer days. You can enjoy the outdoors, cool off, and get some exercise all at the same time! You’ve had your pool for a few years and are looking for a way to make it even better. LED lights are a great way to upgrade your pool this season. Here are some benefits of LED lighting for your pool. 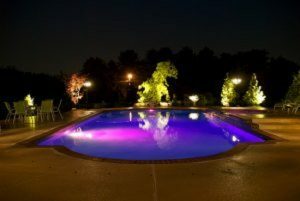 While other forms of pool lighting are more affordable initially, LED lights are way more energy-efficient. This means that even though you have to invest more initially, you end up saving money in the long run. LED lighting will reduce your energy costs and save you some money on those expensive electricity bills. LED lighting is made to last for over 20,000 hours without overheating. There isn’t much maintenance required with these lights since they last for so long. They require fewer replacement lamps which will also save you money in the long run. Their lamps are designed to last 20 times longer than average light bulbs. If you don’t have lighting for your pool, you have to stop swimming when the sun starts to go down. You can’t swim at night time if you can’t see. With LED lighting, you can enjoy your pool safely, even in the middle of the night! A night-time swim is a very relaxing activity and is a great way to get some extra exercise in if you are busy during the day. You can customize your LED lighting any way that you want. They even have lights where you can modify the color when you want or set it to change colors periodically. That way, you can set the mood for any environment . You can set bright, colorful lights for a cookout or a child’s birthday party. If you are trying to set the mood for a romantic evening, you can set your lights to a dark red or purple to really enhance your date night. This entry was posted on Friday, March 23rd, 2018 at 2:41 pm. Both comments and pings are currently closed.